Steve Jobs was joined on the stage today by software and book sellers alike to roll out Apple’s vision of the future. 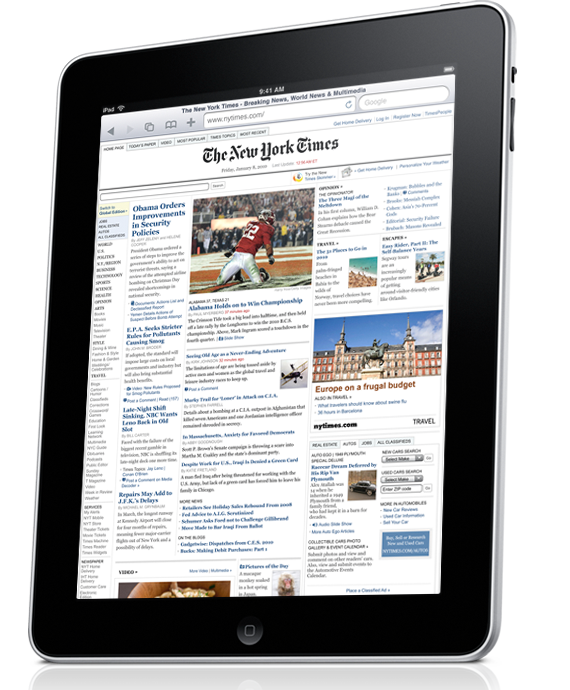 They introduced the world to a Apple branded Tablet computer, the iPad. The presentation jumped right off with the new touch screen tablet. There was non of the usual hub-bub about how Apple has been doing or will be doing. We know all that, they have 10s of billions in the bank. The show was all about a new path forward for many industries. A new way of thinking about books, watching movies, typing out notes and running applications that are controlled with your fingers. The OS does not fall far from the iPhone tree. It is a dot update from the current iPhone OS – going from 3.1 on the iPhone 3Gs to 3.2 on the iPad. If you can find your way around a iPhone or iPod Touch, you can pick up a iPad and jump right in. This is good and bad. Some apps just look and run so much better on a bigger screen… mail, notes and movies are much improved. While, the launcher is just a bigger screen so the icons are all spread out, as well the unit appears to be just big enough to not be something you will walk about the office with. We will let you know as soon as we try that. Here is the iPad… viewing a Web Site via the Built In browser.